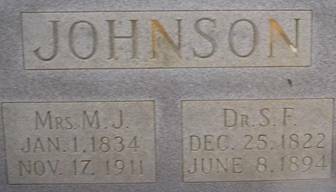 The Johnson Cemetery is located east/northeast of Cloverdale, Alabama. It is encompassed by private land and has been somewhat difficult to locate. Before visiting this cemetery, please ask before going across private property. The cemetery has a chain link fence surrounding it. There is at least one other grave there that cannot be found. 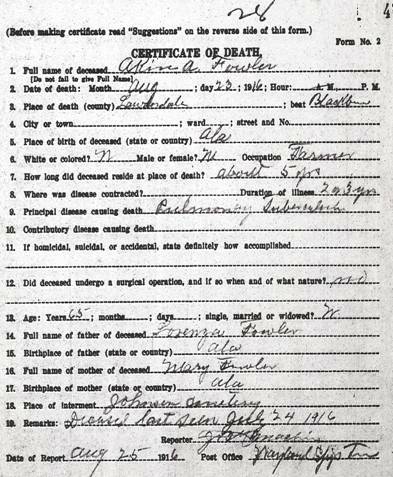 It is the one of Akin A. Fowler, who died August 23, 1916 at 65 years of age, and according to his death certificate (see below) is buried at the Johnson Cemetery. It is said that slaves may be buried nearby also, but there are no indication of any graves. 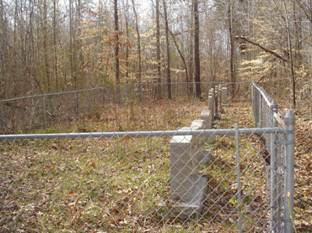 As the above photo illustrates, the Johnson Cemetery lies in a densely overgrown area. The cemetery area inside the fence has at some time in recent years been cleaned. There is only one row of graves, however, at some point in time, it may have been a little larger, with graves toward the east side. Fowler, Akin A.; died 23 Aug 1916, son of Lorenzo Fowler who is buried at the Parsonage Cemetery in this Lauderdale County listing.